The Courteney Collection is made from natural gameskin. Colors and combinations will vary. 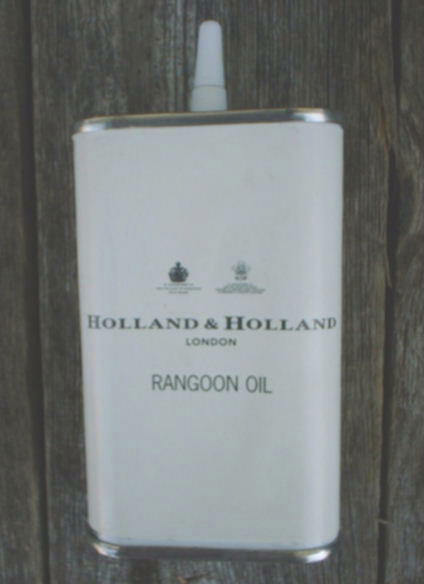 The leather in your hand-crafted Courteney product will age gracefully with time, wear and polish. As with your 'footprint' your boots will become personalized and unique to you. We are re-introducing the Patrol boot for this coming fall. The Patrol boot makes an excellent grouse boot! As its name reflects the Patrol is paramilitary in style, laced to the top with a soft Impala hide collar and full bellows tongue. Designed with the rancher and hunter in mind, the Patrol gives extra support for a hard day's work. We are now taking orders for late summer delivery - Special Order Your Pair Today! The perfect boot when you need additional coverage. A longtime favorite of motorcyclist law enforcement and special ops customers. Special Order Your Pair Today! As tough and dependable as the people who pioneered the country. A fully lined antelope boot, strong and with Courteney's renowned comfort. Not for the faint-hearted - designed for the veteran who won't give up the hunt. This mid-cut, lined antelope boot with bellows tongue will go that extra mile. Tough enough for the most inhospitable terrain, yet sublimely comfortable right out of the box. Exclusively crafted for Westley Richards, the Courteney Selous represents the flagship boot within out comprehensive range of footwear. Constructed entirely of genuine gameskin, each is as individual as the serial number it bears. Select Cape Buffalo skins are hand stitched to form the incredibly tough uppers with a soft Impala skin padded collar surrounding the ankle and lower calf to provide exceptional support and comfort. The vamp is reinforced with overstitched heel and toe box and the entire upper is stitched through to the pure rubber 'tyre' tread sole for all terrain durability and surer traction. The Selous is presented in a Courteney Chronicle traveling sack together with a full range of accessories including polish, cloth, brush, spare laces and alternative innersoles, to keep them in perfect condition for your next adventure. Tough enough for the bush and smart enough for the city. 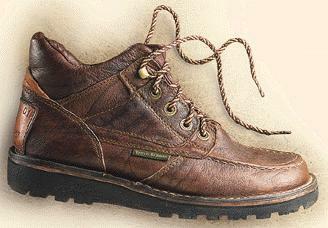 The Tracker is a mid-cut boot suitable for a variety of environments. The upper is hand cut durable Cape Buffalo leather and combined with a soft, Impala skin padded collar at ankle. It is hand sewn to the sole and insole to create an extremely comfortable weather-proof boot, impervious to bush thorns and rugged terrain. 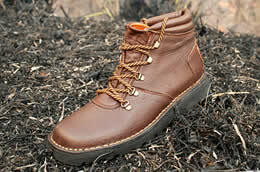 The Tracker is supremely comfortable, highly individual, and immensely practical footwear. These boots transition perfectly from the hunting field to everyday casual use for the distinguished campaigner. All day comfort on the inside. All weather toughness on the outside. Designed expressly for many of our American customers who wished to have the Courteney construction with a more North American character. Handmade from Cape Buffalo skin, with soft Impala skin lining and collar over a lightweight, but extremely durable and comfortable natural rubber sole. For unequalled elegance, the Frontier is also available in premium grade, full quill ostrich hide, which will outlast the most demanding user. For the absolute toughest version of out popular Frontier boot, we suggest the unequalled strength of hippopotamus hide; ruggedly attractive and virtually impervious to wear. 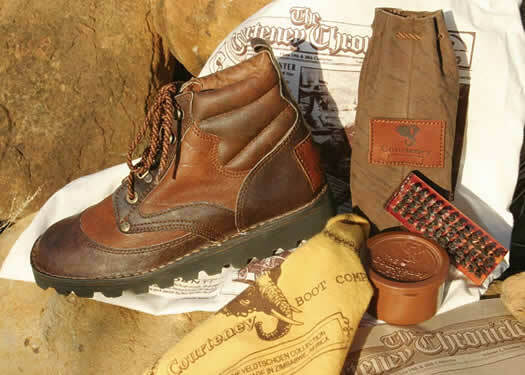 Each pair of boots comes complete with a travel sack, polish, cloth, brush, spare laces and inner soles. 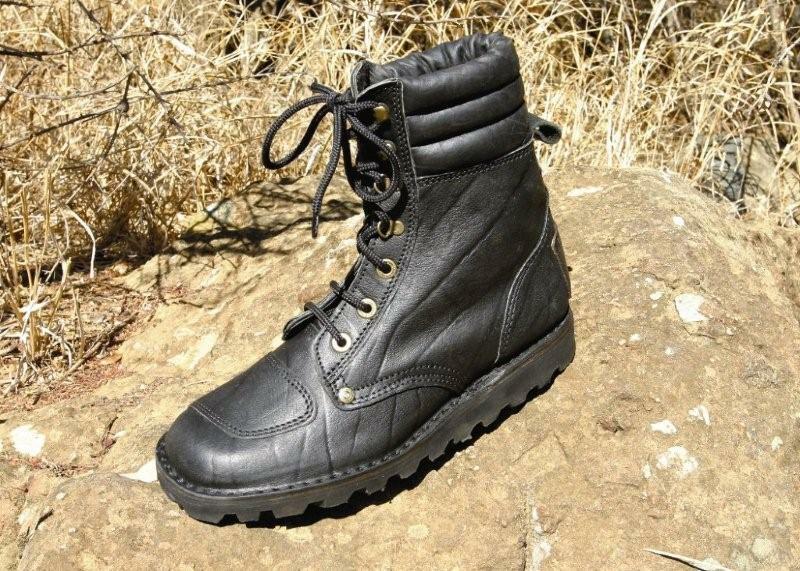 An exceptional choice as a 'true' stalking boot. A slightly modified, four-inch ankle height boot, the Safari affords the very same features as our Selous with the same hand crafted construction and genuine Buffalo hide upper and natural rubber tire tread sole. Brass speed lacing, padded Impala collar plus double stitched and reinforced vamp, provides an exceptional choice as a true; stalking; boot. As with the Selous, the Safari is designed and sized to fit ladies as well as gentlemen, and with a combination of outstanding durability and comfort, we can finally provide proper safari equipment for the intrepid female adventurer. A true sportsman will give his boots as much care as he does his favorite gun, fishing rod or his vehicle. The proper way to preserve leather is through regular and correct polishing. Water and wear remove the original oil from the leather. When the tiny fibers dry out they become hard and brittle and break easily, shortening the life of the leather. Leather fibers burn easily, especially when leather is wet, and should never be dried with artificial heat. For the best result, footwear should be dried out slowly and never be subjected to any extreme heat. Courteney Polish is made from the same ingredients used by the tanner in waterproofing the leather. Rub the polish vigorously into your boots with a brush. Assisted by the heat generated, the polish will work into the pores. 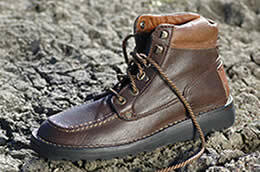 Its frequent use will maintain the original flexibility and water-resistant qualities of your boots.